At the top of the list, with oil changes and brakes, changing and repairing tires is one of the most common jobs at your local repair shop. A good tire changer will, with regular maintenance and some repairs, last for many years. Times are a changing in the tire-changing world! The days of easy steel rims and regular valve stems are fast disappearing. These days there are “soft” aluminum rims, tires with stiff sidewalls and TPMS (tire pressure monitoring system) valve stems that, if serviced improperly, can break. Click here to see how we change tires with TPMS. Keep this in mind when shopping for a new tire changer. When you’re in the market for a tire changer, it’s hard to differentiate between all of the different brands out there, each company trying to put their best foot forward in a bid to win over your trust and loyalty. 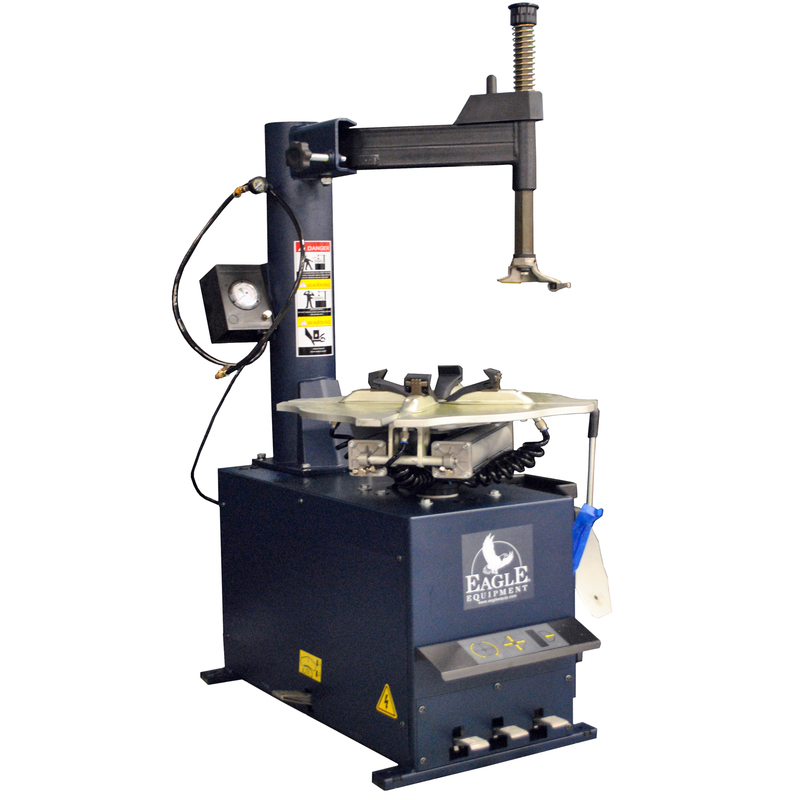 Each brand then has a variety of tire changer models, fashioned to meet the needs of specific niches. Here’s how you can easily select the right changer for you from Eagle Equipment. Size Matters! What type and size of wheels do you want to work on? The size of the wheel: Before you shop for a tire changer, you need to know what size tires you will be changing. Look at the rim diameter of the tires to be changed; 20 to 24 inch diameter is the common measurement of most wheels. If you want to go smaller, like motorcycles …. Or larger, like truck tires … that will determine if a different changer is needed. The type of wheel: Light trucks will utilize a different tire changer from heavy-duty trucks. There are also shops that specialize in run flat tires or low profile wheels. Such tires require special tire changers because the ordinary models may not be able to handle too well. The style tire shop that you are: Do you do a lot of tires? Are you just getting started? Do you want to be able to work on specialty tires or large truck-tires? 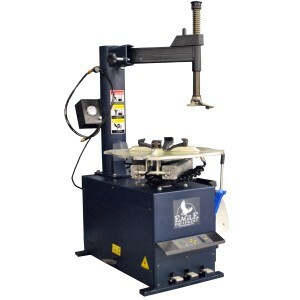 The tire changer you choose will determine the style of shop you are. With these factors in mind, we now need to look at the different types of tire changers available from Eagle. Each style has been designed for specific needs. Now that you know what type of tires you want to work on, here is how to easily find the one that fits. The swing arm tire changers usually are the most economical changer you will find. Easily adjusted so that the duckhead mount/demount tool is properly fitted to the tire rim. This will reduce the risk of damage when mounting and demounting the tire. The user can lock the arm into place by tightening it manually and making it fit perfectly with the size of the wheel. This type of changer does come in handy when the shop is constantly doing the same size tires because the tool head will not have to be repositioned every time and an experienced tech will be able to change plenty of tires in a short amount of time. 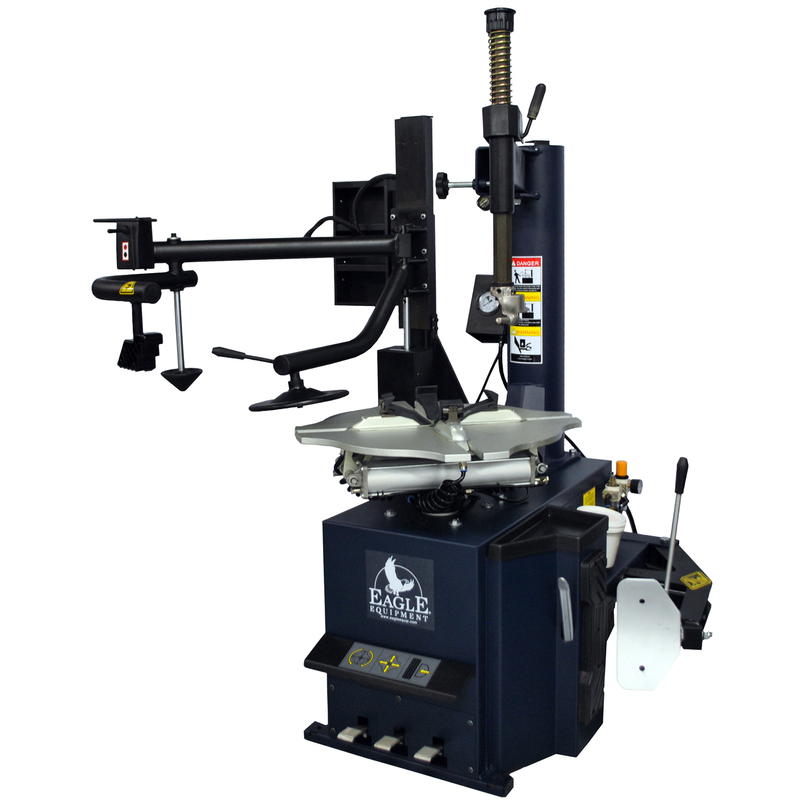 We recommend using this tire changer if you are starting a shop and also if you are going to use it for a particular tire size that way you don’t have to continue changing the tool head every time. 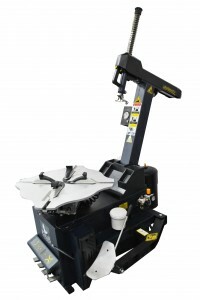 For more specifics, check out the Eagle ETC-550 our most affordable swing arm designed changer or the Eagle ETC-960. Eagle offers the ETC-960T which is like the ETC-960, but with a tilt column. The first thing you will notice about the tilt back tire changer is the price tag for this machine compared to its little brother, the swing arm. The price tag for the tilt back tire changers with some manufacturers will be up to 2 times the amount of the swing arm. The 960T is only a $200 upgrade from the 960. However, you will be able to fit bigger tires and adjust them a lot faster with the automatic tilt-back option, which adjusts correctly to fit the size of the tire. When it comes to changing tires, we usually recommend the tilt back tire changer, it might be more expensive, but it will be a lot easier to use and you will have less risk when it comes to damaging tires if you are not too experienced. Motorcycle tire changers, like the Eagle ETC-400 are less complex than passenger and light truck changers because they deal with lighter and smaller tires and wheels. Their setup is simpler. and Usually, these style changers have simple bead loosening system and rim clamps that are powered manually. Generally, this tire changer only exists in motorcycle repair shops, but if you think you can expand your business by acquiring it, definitely do so. Who knows, you may have to expand to do other jobs for motorcycles! These heavy-duty truck tire changers are huge! The Eagle ETC-990 is a monster. These changers usually have to deal with heavy-duty tires. The ETC-990 handles tire diameters up to 47” and rims between 14” and 24”. Be careful when choosing a heavy-duty tire changer, some are made especially for agricultural, off-road and constructional vehicles and other are designed especially for businesses that maintain a fleet of vehicles. Most of these more advanced tire changers have an integrated wheel lift that helps in handling heavy wheels without the need for lifting hence eliminating operator injury. These are great for truck shops, but if you’re not working on large tires, we don’t recommend owning one of these. Did you know you could add an assist arm to many of the Eagle Changers to assist in changing stiff low profile or run flat tires? This gives it flexibility to work on a variety of wheel sizes and styles with a lot of efficiency. The assist arm attaches to your current Eagle changer and adds a multitude of ability to change different style tires. For only $600, it’s a great investment for your business … and your changer. If you would like to order a new changer with an assist arm, check out the Eagle models, the ETC-550A, the ETC-960A or the ETC-960TA. We hope that we have covered all of your questions or doubts about tire changers but feel free to call us at 800-336-2776 to discuss the different options that you have when it comes to Eagle tire changers.